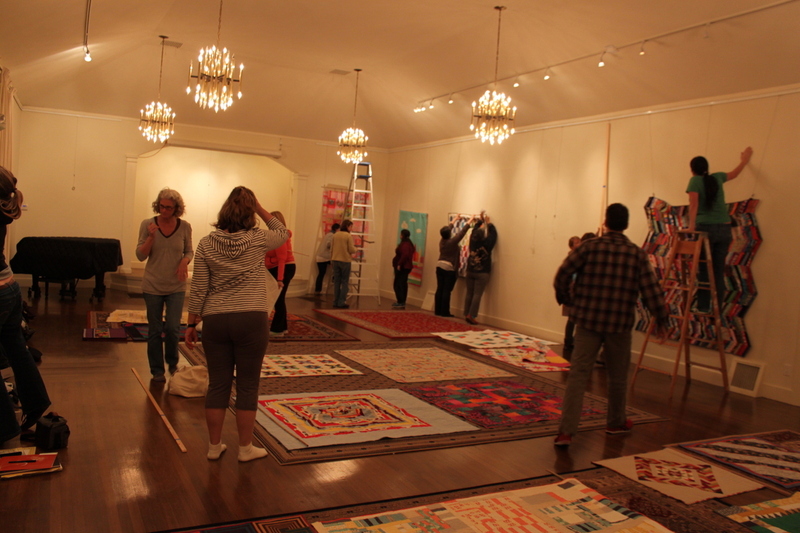 The East Bay Modern Quilt Guild is very excited to present an evening with the artist, Ben Venom and author, collector, and curator, Roderick Kiracofe as they each discuss their work. You can read more about each speaker below. We hope to see you there! 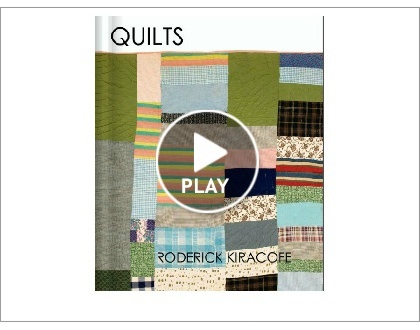 Roderick Kiracofe is the author of many critically acclaimed books, including, The American Quilt: A History of Cloth & Comfort and Cloth & Comfort: Pieces of Women’s Lives from Their Quilts and Diaries. He self-published his latest books, QUILTS 1 and QUILTS 2 and many of the quilts from those books were showcased as part of a special collection at Quiltcon. His newest book, Unconventional & Unexpected: American Quilts Below the Radar, 1950-2000, published by Abrams, will be released in Autumn 2014. 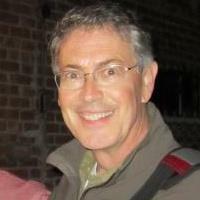 He co-founded The Quilt Digest and curated “Showcase” for volumes 1-5 (1983-1987); produced and designed Yvonne Porcella: A Colorful Book and was a regular participant on the PBS series The Great American Quilt, one of PBS’ most popular series. He was a consultant to the California Heritage Quilt Project and consulted on the selection of the quilts for the exhibition and book Ho for California. He served on the first board of directors for Studio Art Quilt Associates (SAQA) and more locally, he currently serves on the Board of Oakland Art Murmur. Mr. Kiracofe is an art collector and has assembled one the largest private collections of “unique” 20th century quilts and quilt tops. He was also actively involved in the creation of some of this country’s most important private and corporate quilt collections including Bank of America, Levi Strauss & Co., Esprit de Corp among others. He has curated exhibitions in the US and Japan and quilts from his collection have been shown in several museums. If you happened upon the massive quilt at Bay Area Now at the Yerba Buena Center for the Arts in 2011, then you’ve seen the work of Ben Venom. It’s fresh and exciting and it has gotten a lot of attention! His work has been shown in galleries and museums in many cities in the US and Europe. He’s been featured on blogs, magazines, and even been interviewed on NPR. We at East Bay Modern can’t wait to hear him talk more about his work, his influences, and his journey into the world of quilting. Want to see all of the Stitch Modern events? Click HERE! 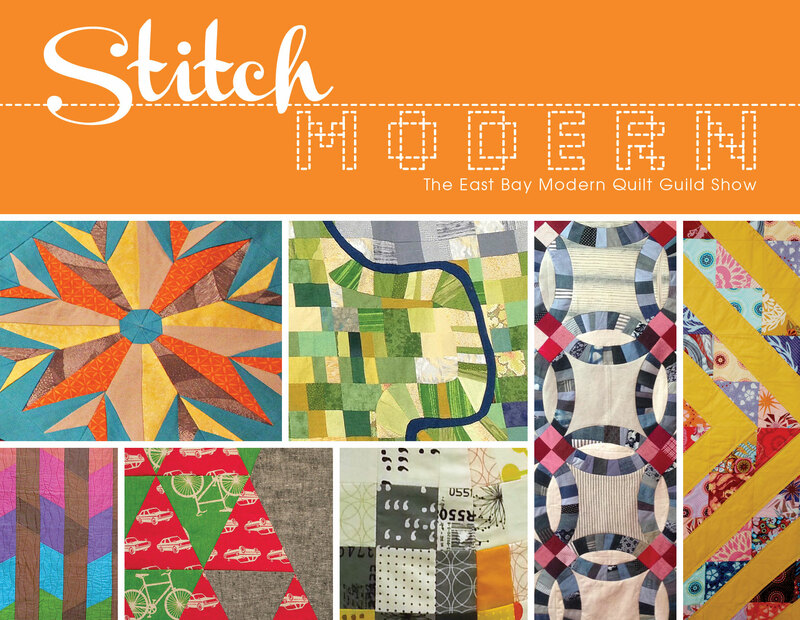 The East Bay Modern Quilt Guild is proud to present Stitch Modern, our 3rd annual quilt show at the Piedmont Center for the Arts. 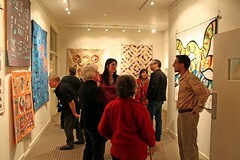 As a group, East Bay Modern focuses on modern design and personal expression through quilting. As a non-juried show, there are no hard rules – this is quilting our own way, whether it’s with the latest fabrics and traditional patterns, or free piecing with no pattern at all! We hope you will join us! Please sign up for our newsletter if you would like more information regarding the programs below. Needle Ceremony- An informal memorial service for our spent sewing needles and pins based on the Japanese Hari kuyou ceremony which happens on February 8th. Bring your spent machine, hand sewing, and pins and join us in celebrating our tools and their service. Panel Discussion, Beyond the Bed: Exploring Quilts in the Public Eye – Please join us for a moderated discussion highlighting how quilts have gone from being household objects to objet d’art. 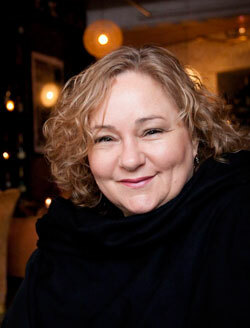 Workshop: Round Robin Improv with Sherri Lynn Wood. Click here to find out more and sign up for the class! Valerie Gibbins, Terri Carpenter, Carol Van Zandt. The month of February was quilt crazy! 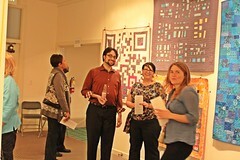 The East Bay Modern Quilt Guild’s second annual show, Stitch Modern, was a huge success. 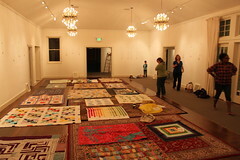 We hung the show again in the lovely Piedmont Center for the Arts and had so many wonderful quilts that we almost ran out of wall space! 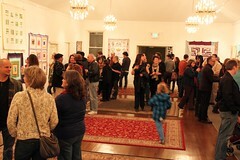 We started the month-long show with a big opening night party and everyone was invited. The food was almost as amazing as the quilts! 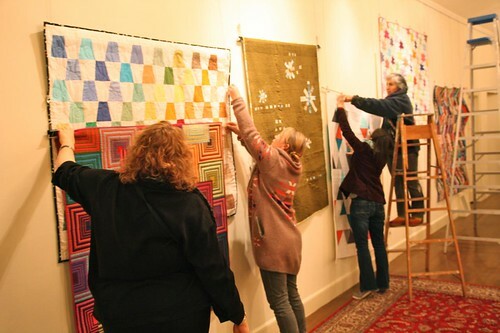 In conjunction with the show, the guild decided to host some quilt-related events. 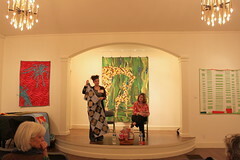 We began with a lecture and trunk show by the artist, Sherri Lynn Wood. 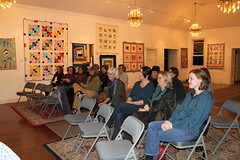 She spoke about her work with textiles and her method of improvisational quilting. Her talk was inspirational and thought-provoking and her presentation was a gorgeous riot of color. I know that quite a few of us left with new ideas about how to approach our own projects. Our next event was a Fabric and Textile Panel Discussion with Pati Fried, Jennifer Moore, Sandy Klop, Carol Van Zandt, and Ellen Heck and moderated by Kim Andersson. 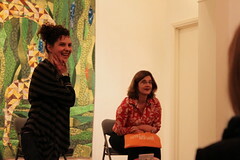 It was such a success that we almost ran out of space in the gallery to seat everyone! It was a great honor having these women come and share their knowledge and experience. We all learned so much about the design process and some of us even won fabric from the designers! It was a great afternoon! The following afternoon, we were back in the gallery for Family Day. Kids and grown-ups alike stopped by to play with fabric, glitter and glue to make Valentine’s Day cards. 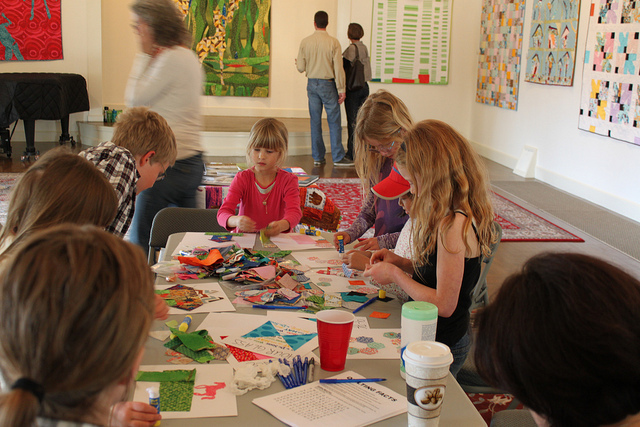 The kids that couldn’t sit still long enough to make a card ran about the gallery on a quilt scavenger hunt. The next event was a lecture by Kristine Vejar about her work in India studying the appliqué quilts of a nomadic group called Rabari. She showed us many amazing pictures from her time there and shared her even more amazing Rabari textile collection. Wow. The attention to detail in the hand-work is unbelievable. I can’t wait to take her Rabari appliqué class and give it a try! If you missed Stitch Modern at the Piedmont Center for the Arts, you can still catch it on March 9 and 10th at the SF Quilt Guild’s annual show at the Concourse Exhibition Center in San Francisco. If you miss it there, you can see what you missed over on the Stitch Modern Flickr group! 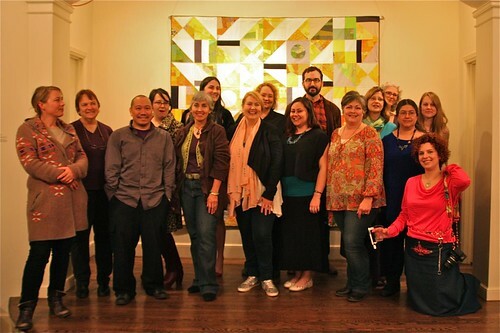 Thank you so much to all of the speakers, volunteers, and of course, the makers who all helped to make Stitch Modern 2013 such a spectacular quilt show! *Most of the photos shown above were taken by Joel Ignacio. Thank you, Joel! 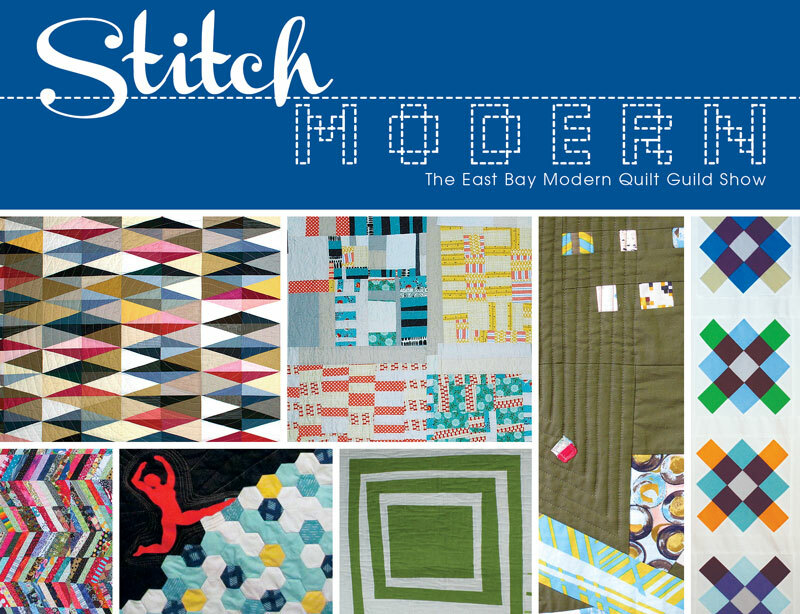 Stitch Modern, the East Bay Modern Quilt Guild’s 2nd annual quilt exhibit is almost here! The show will be held at the Piedmont Center for the Arts, where it will be on view to the public during regular gallery hours (Fridays, Saturdays, and Sundays from 12-3), as well as during Stitch Modern Special Events. While we are super excited to show you our fresh, new quilts, we will also be hosting a lot of really spectacular textile-related events in conjunction with the show. Please click on the links below to get more information about each event. We begin the exhibit by inviting you to our Opening Night Reception. 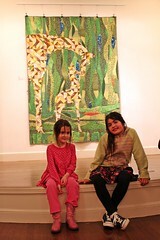 Everyone is invited to come to this fun, informal party to view the quilts and to meet the artists. The reception will be held at the Piedmont Center for the Arts . Handmade Market – Held during most special events, Piedmont Center for the Arts. Our members have tons of talent and will be selling an assortment of handmade items at some of the special events – so make sure to bring your wallet in case you see a one of a kind item that you can’t live without! All of these events are open to the public and most are free of charge. We hope you’ll join us and find out why we are SO EXCITED about quilting! Family Day at Stitch Modern is back! 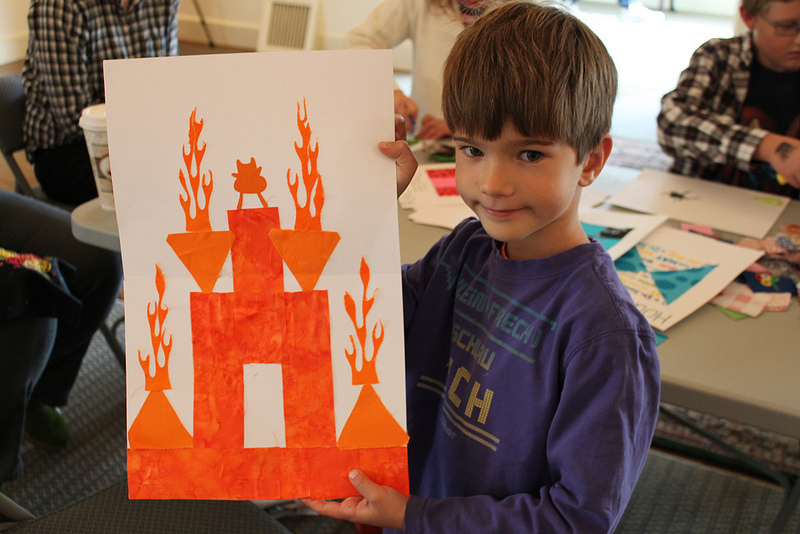 Bring the kiddos and join us on February 10th from 12:00 -2:30 for a fun day with textiles. Last year, this event was a great hit with kids and grown-ups alike. There will be a scavenger hunt, fun crafts, and snacks! 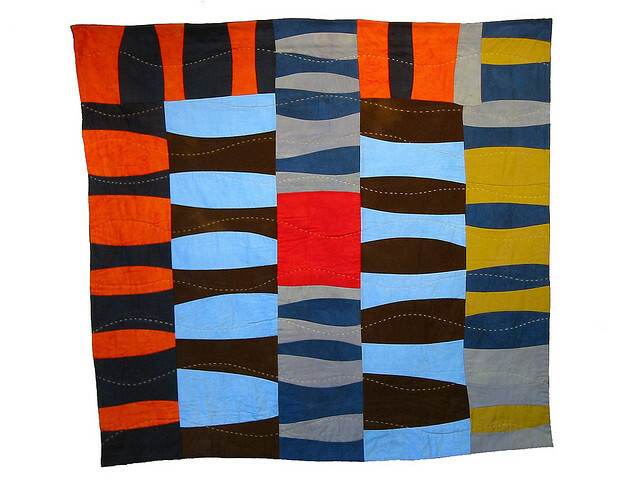 It will be a great opportunity to explore the world of fabric and thread with your whole family, plus you can check out the quilts of the Stitch Modern 2013 show while you’re there. So, join us February 10, 2013 from 12:30 – 2:30 at the Piedmont Center for the Arts. This event is open to the public and the cost is FREE!!! Please join the East Bay Modern Quilt Guild for a lecture by Kristine Vejar, founder of A Verb for Keeping Warm, as she discusses the gorgeous, appliqued textiles of three nomadic camel herding tribes in India, known as Rabari. Kristine has a deep love and appreciation for natural fibers, natural dyes, and textile traditions. She has received numerous accolades for her work, including a Fulbright Grant to India, and has consulted with the Textile Museum in Washington DC. She opened her Oakland shop, A Verb for Keeping Warm as a way to combine her work in India with her life in the U.S.
A Rabari camel cover applique, c. 1960. Threads of Transition, Patterns of Change: Rabari Appliqued Textiles of India includes colorful textiles made by three distinct communities of semi nomadic camel herders in India. Kristine’s talk will present examples of textiles that would be included as part of a dowry: camel covers, quilts, wall hangings and bags. Using broadcloth as a canvas, Rabari women appliqué and embroider motifs selected from their remote desert environs of Northern Gujarat, India. With the arrival of the modern age and the decline of their nomadic lifestyle their stories are told through their textiles. A Vaghadia Rabari woman with her appliqued quilt. The lecture is based on Kristine’s research during her residence in India on a Fulbright Scholarship from 2001 – 2002 and shows how the three groups of Rabari exhibited changes to their motifs and materials throughout the prior 50 years. If you want a little sneak peak into Kristine’s experience, you can read the great article written on the Oakland North blog about the Rabari Textile Exhibit when it was on display at A Verb for Keeping Warm in 2011. A young Rabari woman beginning an applique border. As with all of the events during Stitch Modern, the general public is welcome (and encouraged!) to attend. This is a free event that will be held at A Verb for Keeping Warm, 6328 San Pablo Avenue, Oakland, California 94608. Capacity to this event is limited to 30 people. Please RSVP to save your spot! 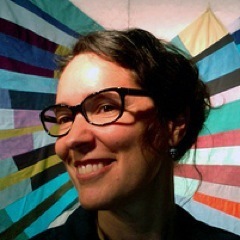 On Tuesday, February 5th, from 7-8:30pm at the Piedmont Center for the Arts, The East Bay Modern Quilt Guild is honored to present a lecture by Sherri Lynn Wood on Modern Improv Quilting and Process. 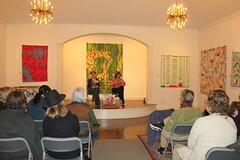 Sherri is a Bay Area artist who is recognized internationally for her work in the textile arts. With an MFA in sculpture from Bard College and a Masters of Theological Studies from Emory University, she is a rising star in both the art world AND the quilting world. (Yes, the two are very separate worlds, but she’s working on changing that!) We are catching her right before she heads off to teach at QuiltCon, she teaches regularly at Penland School of Craft and she was just awarded the Joan Mitchell Foundation Grant for Painters and Sculptors in 2012. Sherri shows her work in museums and galleries nationwide and has been making quilts professionally and with passion since 1989. She is currently in the process of writing an Improv Handbook for Modern Quilters. So, you can see why we’re so excited to have her! Her lecture will focus on modern improvisational quilting as a multidisciplinary meditative practice that moves beyond design and the wonky tricks of the trade. She will review the history and tradition of African American improvisational quilts; introduce key concepts of improvisation through the disciplines of theater, music, and drumming, such as joining, repetition, limits and scores; and share mind-tools for unlocking inner resources that can move your work beyond design, in order to communicate a powerful sense of presence, discovery and authenticity. Essential info: The lecture will be held on Tuesday, February 5th from 7-8:30pm. The event is open to the public and there is a small fee of $5 to be paid at the door. There will also be cool door prizes! The East Bay Modern Quilt Guild is asking the question that everyone wants to know the answer to: What’s it like to be a fabric designer? On Saturday, February 9th, from 12:30-1:30 at the Piedmont Center for the Arts, please join us to find out the answer! We’ve lined up a crack team of local, Bay Area fabric designers to tell us about their process and to answer all of our burning questions. Whether you’re interested in textile design as a process, or just a fabric collecting fanatic (it’s okay to admit it! ), you’ll find this panel discussion fascinating. 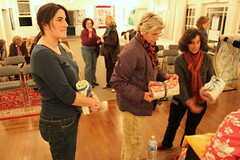 Kim is one of the original members of the East Bay Modern Quilt Guild. Five years ago, when she moved to San Francisco from Sydney, Australia, she was in awe of all the fabulous fabric and pattern available here. So, she bought a sewing machine and started to sew again! It was through wonderful modern quilting fabrics that her passion for pattern was sparked again. (By the way, the girl’s got mad graphic design skills!) She’s currently developing her Fabric and Surface design skills at the The Institute for Textile Print Design here in the East Bay. She loves trend watching and researching her designs, and like many of us, she’s got a thing for Pinterest. Keep an eye out for her new pattern inspired blog, I Adore Pattern, coming soon! Ellen is also one of our own. She sneaks quietly into meetings and then shyly whips out a stunner quilt and a stack of fabric to share, so you know we love her! Ellen designs fabrics with her mother through Cathy Heck Studios where they create the most adorable line of children’s fabrics. Ellen is also a very accomplished studio artist and you can see more of her fine art work on her website. 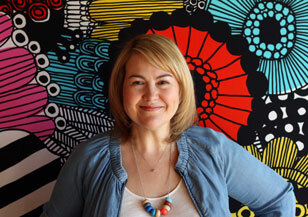 We first met Pati at Stitch Modern 2012, where we were won over by her enthusiasm and openness. Pati won’t have to travel far for this discusion, as she is lucky enough to live in the hamlet of Piedmont, which has has been a strong influence on Pati’s style of design. Living in such a scenic and culturally rich community has had a strong influence on her design style. Inspiration surrounds her everyday. Mixing colors, designs and textures finds a natural path in her life. You can see examples of this in one of her latest fabric lines she designed with Mark Lipinski for Northcott. Read more about what makes her tick on her blog. Does Sandy Klop need an introduction? Maybe you haven’t heard her name, although probably, you have, but I’m sure you would recognize her fabrics. Designing for Moda, she has created some truly iconic prints. Her aesthetic is unmistakeable and she has built a fabric and pattern empire on her vision. We can’t wait to meet her! We also are very excited to Jennifer Moore! 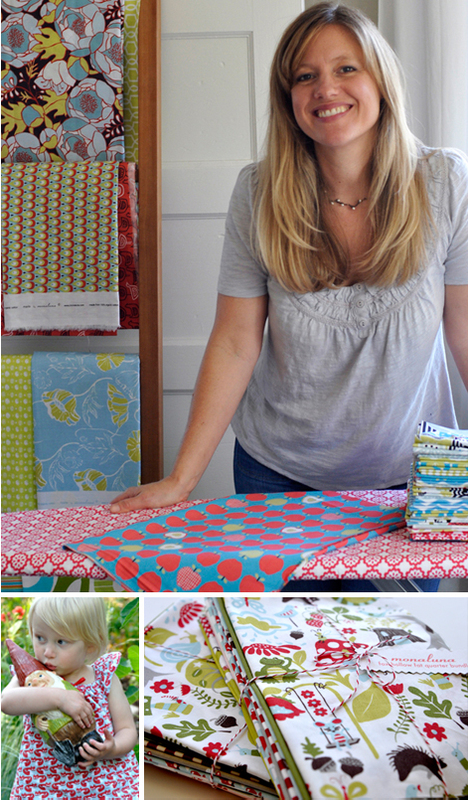 Her fabrics are crazy cute AND organic! She’s worked for some of the biggest names in the biz (Target and Pottery Barn Kids, just to name a couple) and we are dying to learn more about her journey from the big brand corporate world to independent, socially responsible entrepreneurship. And, did I mention, her fabrics are CUTE! Carol is a familiar face at East Bay Modern meetings. She impressed us right from the beginning by introducing herself from behind a huge stack of her beautiful fabric. Her explanation of the design process behind her fabric line was so fascinating that it spurred the idea for this whole designer panel discussion! Carol’s work is heavily influenced by her time spent abroad, including long residences in Tokyo and Taipei. Check out her website to learn more about her, see her fine art work, as well as her textile work, and read her two (yes, TWO!) blogs!